What is being requested in the proposal? American Prairie Reserve is requesting to expand bison grazing on an additional 17 BLM grazing allotments and 18 State grazing leases, which APR currently holds. Presently the BLM and State has approved the 264,466 acres for cattle grazing only. In addition, the proposal seeks to replace rotational cattle grazing practices with year-round continuous grazing of bison, which will restore grasslands and habitat to more natural conditions. Implementation will require the removal of an estimated 250+ miles of interior fences and the reconstruction of another 250+ miles of perimeter fence to meet wildlife friendly guidelines, which will benefit the movement of native wildlife. 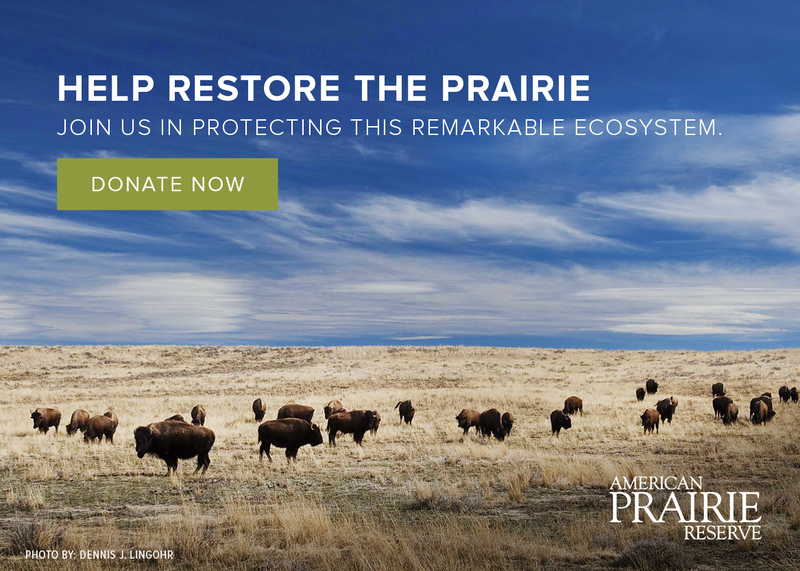 American Prairie Reserve has acquired almost 400,000 acres of land for bison and wildlife restoration. The total acreage– comprised of leased public land and the Reserve’s private lands– is enough to support nearly 6,000 bison, but the herd needs access to the Reserve’s leased public lands to reach that potential population. The gradual expansion of the bison herd will enhance restoration of significant populations (many imperiled) of America's wildlife, rangelands, and riparian areas; fuel new outdoor recreation and hunting opportunities; and drive new visitation and tourism in the region. Where are the areas impacted by the proposal located? The 17 BLM grazing allotments and 18 State grazing leases are in Chouteau, Fergus, Petroleum, Phillips, and Valley Counties of Montana in the vicinity of the Charles M. Russell Wildlife Refuge and the Upper Missouri River Breaks National Monument. What gives the Reserve the right to make this request? The Reserve holds priority grazing privileges on the BLM grazing allotments, which were acquired through the purchase of the associated base properties – properties that were purchased by American Prairie Reserve, along with State grazing leases, from willing sellers in free market transactions. The Reserve currently leases the grazing to cattle ranchers, however, it is well within their legal right and furthers their mission to request a change of livestock to bison and a change in the grazing season. Is American Prairie Reserve’s request for removal of interior fences and year-round grazing a case of special treatment from the BLM? No. Our request for change of use is consistent with BLM policy and regulations. Any holder in good standing of BLM grazing leases may make the same request. The BLM has issued numerous year-round grazing permits, some of them in Phillips County. Year-round grazing is not a common practice in Montana. From an operational perspective, this can be extremely difficult in winter and may be uneconomical. Bison, the region’s native grazer, are much better adapted to extremes of climate and utilize the range very differently than cattle. American Prairie Reserve has over a decade of experience with year-round grazing, absent interior fencing, on our Sun Prairie Unit. This management unit is subject to all BLM regulations and meets or exceeds BLM standards for range and riparian health. The BLM’s evaluation of range health on the Sun Prairie Unit is a matter of public record. Would year-long continuous grazing with bison impair the prairie? No, plants and animals of the mixed-grass prairie co-evolved with bison for thousands of years. The transition back to bison offers an evolutionarily-tested means to help the BLM meet and exceed the five standards for rangeland health, as stated in the BLM’s HiLine and draft Lewistown management plans. In addition, science shows that at low to moderate stocking levels rangeland health can be maintained with year-long grazing. Due to the potential for drought in the region, American Prairie Reserve is proposing the bison stocking rates on their deeded land is calculated using the Natural Resource Conservation System (NRCS) method for low moisture years. Furthermore, all BLM permittees and State lessees (including American Prairie Reserve), are required to meet rangeland health standards regardless of the class of livestock or grazing system/season. Has the BLM and State approved bison grazing or year-long grazing on public lands before? Yes, bison grazing on public lands is an established practice. The BLM has approved bison grazing on 39 other BLM allotments in six Western states. In fact, American Prairie Reserve has been approved to graze bison on two BLM allotments and two State leases in Phillips County, totaling 19,314 leased public acres and 2,694 AUMs. APR bison grazing was first approved on these areas in 2005. Further, range health has been sufficiently maintained on the portions of the area that have been grazed year-long by bison since 2008. Many BLM grazing permits already allow year-long grazing of cattle, some of them in the APR region. However, most BLM year-long grazing is also associated with a pasture rotation system and the APR proposal would eliminate that system on their allotments. Scientists, managers, and ranchers have found that bison, at appropriate stocking rates, do not require rotational grazing to maintain rangeland and riparian health because they cover more ground and forage at far greater distances from water than cattle. Examples of this can be seen in National Parks and Wildlife Refuges, State Parks, and State and non-profit reserves. The removal of interior fencing will contribute to the restoration of natural bison grazing patterns, and will also benefit wildlife such as pronghorn that are negatively impacted by fences. How does the proposal impact the agriculture economy in the area? Transitioning 17 BLM grazing allotments and 18 State grazing leases from cattle to bison would affect less than 33,000 leased public Animal Unit Months (AUMs). That acreage would only feed a small percentage of total cattle in the region – 2,750 cows for a year with a suckling calf by their side for a portion of the year. This proposal has a minimal impact on ongoing economic and demographic trends. In 2017 in the five counties affected by APR's proposal (Chouteau, Fergus, Petroleum, Phillips, and Valley) there were a reported 321,500 cattle. Since 2010 the annual change in cattle numbers in these five counties has ranged from -3.5% to +6.1%, driven by much more significant events including market conditions, weather, and the individual choices of ranchers. The grazing receipts collected by the BLM and State for the leased AUMs would not change under the proposal. Per capita fees to the State would increase with the proposal because the annual fee for bison is almost three times per animal what it is for cattle. Would the transition from cattle to bison happen overnight? No, we expect the BLM decision on the Reserve’s request won’t be made until 2019 and the State decision sometime after that. If approved, the proposal would be gradually implemented as the population of bison grows and additional pasture is needed. It is estimated that, with approval, all 17 BLM grazing allotments and 18 State grazing leases will be transitioned to bison by 2030. Is the Reserve in good standing with BLM and State? Yes, the Reserve has consistently met BLM permit and State lease obligations– including paying fees and maintaining rangeland, soil, and riparian health– and complied with other permit requirements. The Reserve also meets the legal requirements for disease testing by the MT Department of Livestock, have been very responsive the few times bison escaped from their pasture, and allocate a significant amount of time and funding to build and maintain fences. There are no instances where American Prairie Reserve bison have harmed or attempted to breed neighboring cattle, spread disease to neighboring cattle, or caused damage on the neighbors’ property other than fences, which American Prairie Reserve repaired. Likewise, we know of no instances where Reserve bison harmed people. How does the American Prairie Reserve proposal impact the food supply? Very minimally, if at all. The number of cattle transitioned to bison under this proposal is miniscule in the larger cattle production picture in the region and in the USA. Only about 40% of cattle in the West and 19% in the USA graze public lands for a portion of the year, and the APR proposal only impacts a minimal portion of the public land open to grazing in Montana and the West. Furthermore, due to the price, beef is generally not available to the people in the world most at risk of suffering from hunger. Finally, bison harvesting–resulting in the harvested bison meat being consumed by humans–is a population control method that the Reserve has begun to use with the intention of expanding over time.